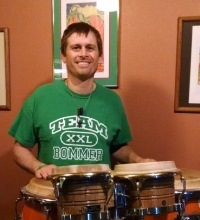 I am writing on behalf of my brave friend Brian Bommersbach who is in need of a lifesaving transplant. He is 39 years old, a loving partner of 15 years to Amissa Kitzberger and an adoring father of his 7 year old daughter Kya. He is also one of the kindest most approachable guys I know. Brian and Amissa are hard workers who have climbed all the way out of debt and started their own, very busy cleaning business. Their goal was to buy a home and provide for their daughter. In May of 2013, this young family’s happy life took a dramatic turn when Brian was diagnosed with B-cell acute lymphoblastic leukemia (ALL), a very aggressive and potentially deadly cancer of the blood. Brian was admitted to St. Luke’s Presbyterian Medical Center in Denver to start a chemotherapy regimen. Thankfully, a matched donor for a stem cell transplant was quickly found with the hope that Brian’s immune system reset and would keep the leukemia from coming back. Brian enjoyed a year and a half in remission before he was starting to feel that something was just not right. On March 25th of 2015 Brian received distressing news- the leukemia had relapsed. He is going through a new chemotherapy regimen that will require Brian and his family to leave their mountain home and stay in Denver for about a month. Doctors are also planning another stem cell transplant, likely in a couple months, so some time in August. Although Brian is fortunate to have health insurance, there are many uninsured medical and relocation expenses that Brian and Amissa face. At a time like this, the support of his family and friends is critical to ensure a successful recovery. I am asking for your help in Brian’s fight for his life. To ease this financial burden, a fundraising campaign in Brian’s honor has been established with HelpHOPELive, a trusted nonprofit organization that has been providing community-based fundraising guidance to patients and their families for more than 30 years. All donations are tax-deductible, are held by HelpHOPELive in the Midwest/West Stem Cell Transplant Fund, and are administered by HelpHOPELive for transplant-related expenses only. Your contribution would be greatly appreciated. We thank God for each day and for wonderful friends and family supporting him along this journey. Thank you for any help you can give. We just want to say thank you for all your support. Brian is doing well. Finishing up at the hospital right now. PET scan and bone marrow biopsy today, then we get to spend the weekend at home before moving on to the next phase of treatment. The biopsy results will determine what happens next, but it sounds like either way he will be admitted to the hospital on Monday the 18th of May.